Here’s dad in the hospital. Heart attack while out walking. Unconscious for unknown time, phoned in by a passing Samaritan. Machines to push the air, control body temperature. Drugs to tweak heart rate, blood flow, control seizures – really another kind of small machines – alchemical technology. Only half the job though. The big question is the mind. Is there anyone in there? We’ll see about that in a couple days. Or not. Epilogue : In the end, while the care in the hospital was excellent, Allen Douglas Holmes would never regain consciousness. Damage to the brain following his heart attack was extensive. He passed on Dec 9/14 at age 71. Anyone who knew him would agree he lived his life on his own terms. That is the best lesson he leaves the world. Thanks everyone, for the support and well wishes. Mark, hoping it turns out well for your father–and you! My thoughts are with you both. Prayers for him and your family. Very frightening, I know. Praying your father gets to see this drawing….really soon ! I read your post about your dad. It’s getting a hard time for all of you! Will keep you in my thoughts, hoping everything will turn out well. So sorry this is happening to your Dad, your drawing is so tenderly done brings tears to my ears… and floods back the memories of my Dad that I lost some 10 years ago. Good Samaritan was just in time, I’ll be keeping your Dad in my thoughts and prayers. Such a blessing he was found! Hoping, praying for a good outcome! 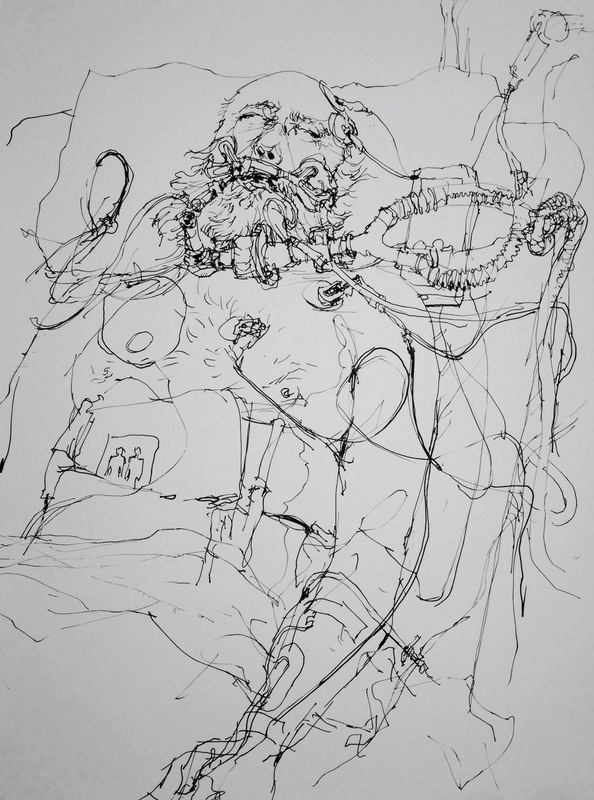 Your sketch shows so vividly modern medicine and how it can work amazing things and yet at the same time the overpowering personal suffering you are experiencing. Thanks for sharing how art can record and help you deal with a major personal moment! You are generous with your time and talent and now you are generous in sharing with your community. Know that you and your family are in our thoughts and prayers. I hope this difficult time brings your family closer together. My thoughts and prayers are with you, your father and your family. I enjoy your sketching and posting so much. I hope it gives you a measure of comfort while you deal with these hard life events. So sad to find this when I opened my email this morning. I will keep you in my thoughts and hope that your Dad will rise again to be his old self. Keep drawing, or painting, it helps keep you sane in times like this…I have been there so I speak from experience. Such a sensitive, powerful drawing – hoping/praying for your dad and his family. Marc, I’m sending good thoughts and courage for the days to come. Know that there is a big crowd of people out here pulling for your dad and for you and your family. I’m glad you sketched him. I did the same think when my mom was in the hospital and it was surprisingly comforting. I hope your father recovers fully from his ordeal. Best wishes to him for a speedy recovery in good health and let’s hope he was found in time. May the Divine Take Care of your Dad. Sketching is like Meditation….sit by his side express love to him by sketching. OUR PRAYERS AND GOD BLESSINGS ARE BESIDE YOUR FAMILY. Dear Marc, this is both scary and beautiful. You have drawn so much life in your father. Bless the unknown Samaritan, and you for creating art, documentation and observation in the face of adversity. Sending you warm wishes for your father and you. I hope he, and you, get through this. Wishing you all the best for your Dad. Great drawing full of power and emotion. Oh M, so sorry to hear about this turn of events with your father. I hope all turns out well. My prayers go out to you and your family, for comfort and for a full recovery for your father. Your sketches have encouraged and supported me in difficult times. May God and the broader community bless and support you and your loved ones as you watch and wait. Marc! Oh, Marc…I am so sorry to get this news. Suhita forwarded me this drawing. It took my breath away and started me trembling. With your drawing you have channeled the gravity of the situation and focused your life force on your dad. Stay strong. Keep drawing. May your father rise whole from this state. I wish the very best for your father and your family, and I hope your father be ok really soon! Fuerza Marc! Marc, Hope everything will turn all right for your father…body and mind ! Your sketch is beautiful, sensitive … Your own therapy! Sorry to read about your dad. My best wishes for healing and recovery. I also know the this fork in the road where the future in uncertain. And, I also sketched and it helped a lot. I will send good thoughts aimed directly at your Dad. Be brave for your family. Sending positive vibes over the www. Oh, my. How tragic! I’m so sorry to hear about this. It is such a heart wrenching experience to have a loved one in this situation. I will keep you in my thoughts. Beautiful drawing. Sending prayers your Dad will be up walking and enjoying his portrait soon. worn thin our drawings there were among the most imaginative either one of us have ever created. Drawing is a gift that helps us cope, thanks for sharing your gift! You’re blessed and very fortunate Marcia to have that experience. So sorry to hear about your father, hoping he makes a full recovery. Very scary situation. Hope all turn out well. Your drawing really shows the chaos that may well be the best healing approach. Thanks for sharing this difficult time. My prayers to all of you. So sad to read this post Marc. Hang in there and courage for you and your family. Thinking of you. May the force be with you and your father at this very difficult time. Obi Wan. Wishing all the best for your dad and your family, Marc. healing thoughts your way Marc. Wishing you and your dad the best, and sending healing thoughts your way. Don’t know you or your dad, but you’ll be in my thoughts when I go to sleep tonight. I was an ICU nurse, and my mind instantly filled in the spaces to make this more of a photo in my mind. I also saw your little picture. Talk to him; and watch for a response on the monitors. I believe no matter how deep the coma, he can hear you. Peace. So sorry to hear that. You must be very painful, helpless and hopeless… but Don’t give up! I am so sorry that you are facing this. I hope you continue to find strength in the days ahead, and that your father’s outcome is the best possible. I know it looks crazy to have so many machines attached to a person. I was at my grandmothers side in the hospital before she was brought home and later passed away. She had a tube in her head to drain the blood and swelling from a fall. There was literally a sack on the outside to store all the blood that drained. Horrible to see, but glad we’ve advanced the point of being able to help suffering people. Will pray for all those in the hospital hooked up to machines such as the one in your sketch. Great post! I feel for you, Marc, as I went through a similar experience with my father. Tough to watch. We feel so helpless, yet our love is so strong we want to do something to receive their suffering. So sorry to hear about the loss of your dad. My prayers go out for you and your family. It has only been a week, that I started following your blog. Sorry to hear of your loss. Marc Taro, I wish to extend my great sympathy. I’m sorry for the loss of your father! That’s quite an excruciating final portrait..
My father is dying of cancer. He is in palliative care right now. Sorry to hear it Jean. I hope you’ve been able to have some time with him at the end. I felt shy, maybe even a little intrusive, when I sketched my mother a few hours prior to her dying. Yet when I think about that little drawing, something passes between her and me even now. Partly because I memorized her face, something a photo can never give me. Partly because it was an intimacy unlike any other. Seeing your drawing touches my heart. My sympathy to you, and your family. I was also little odd about it – not for him, (he wasn’t there, and wouldn’t have minded if he was) but for the other family in the room. But I felt, there was only one chance to make this drawing, and even though he would never see it – if some miracle occurred – then it had to be done just in case. I wouldn’t want to be explaining later how I didn’t make the effort. On a soul level I think your father was very present for you. I’m so glad you seized that precious moment and channeled your prodigious artistic gifts into that final drawing, a final imprint of your father’s life. No matter that you will ever know if he was aware of your drawing. By drawing, by bearing witness you gave your best. What more can a son do? Thanks Marcia. I’m not an overly thoughtful person on spiritual matters (raised by scientists :), but it’s true what you say. I hesitated to use the word ‘soul’, not knowing your belief system well enough. I, too, was raised by scientists. But there was a mystical-Jewish perspective oddly intertwined, which I am thankful for. It allows me to explore life’s mysteries and magic without needing definitive answers. Your words about drawing your mother close to dying were so tender and meaningful to me. Thank you. I did something similar with my mother 8 years ago. Sitting vigil by a dying loved one feels like an ancient ritual. Being witness to someone’s passing is a supreme gift–the bookend to being at a birth. Marc, I have been following your posts for a while now and I purchased a copy of your book. I was sorry to learn of your Father’s passing. I can tell by the way you write about him he was loved. My prayers are with you. It is never easy to loose a parent regardless of circumstance. Sorry for catching this one late, Marc. Best wishes to you and your family. So sorry for your loss.